Need to get rid of Earwigs? Earwigs are brownish to black in color, narrow-bodied, elongate, and somewhat flattened looking, ranging from ¼ inch to 1 inch in length. Adults may be winged or wingless, and they have chewing mouthparts. They do have antennae. These bugs are active at night and hide during the day. They are similar to cockroaches, in which they prefer to hide or rest in dark – moist cracks like those found under tree bark, beneath stones, boards, and other debris. These pests have a diet consisting of a variety of plant and animal matter. They feed on leaves, flowers, fruits, and fungi, as well as on aphids and larger insects such as flies. 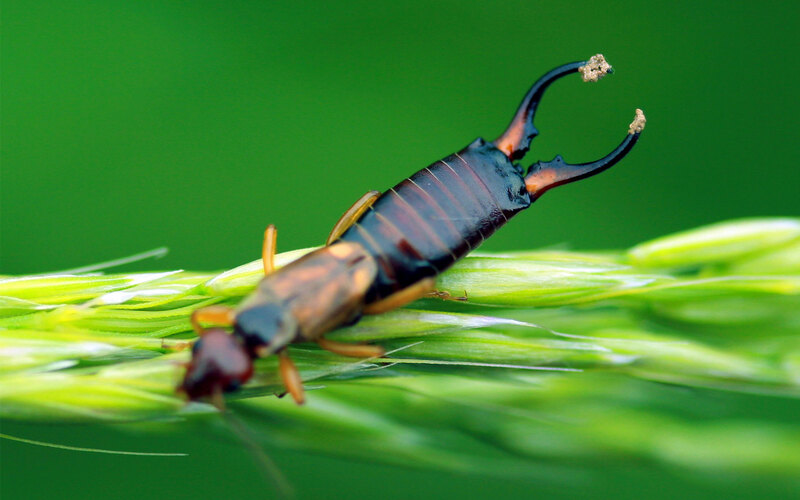 For long term control, the first line of defense with managing earwigs is the elimination of outdoor harborages such as piles of lumber, brick and decaying plant matter. Elimination of heavy ground cover vegetation near buildings is suggested. Tree and shrub limbs should be trimmed away 2-3 feet from the walls and roof. Gutters need to be cleaned of leaves and other debris. If you have an issue with earwigs and want additional information, please call our office for prevention and treatment options.